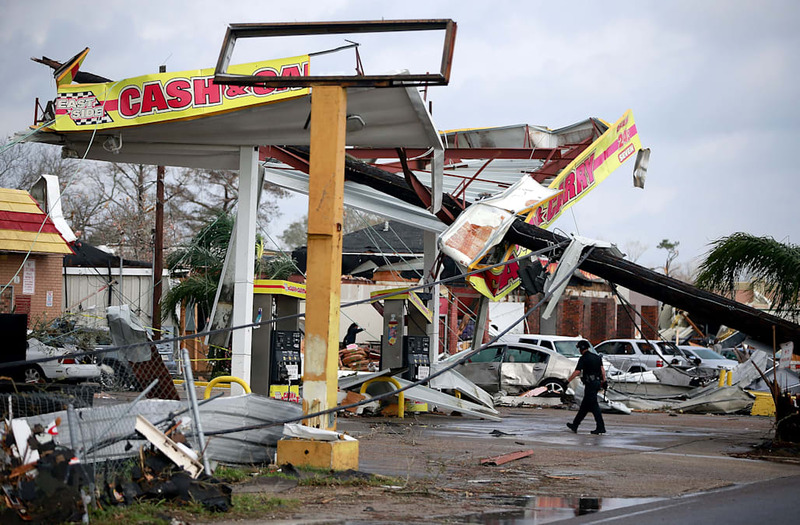 At least four tornadoes were spawned by a storm system that swept through Louisiana Tuesday, with widespread damage reported in parts of New Orleans. Gov. John Bel Edwards declared a state of emergency in the wake of the damaging storms and said he will travel to southeastern Louisiana to survey the destruction left behind. One of the hardest-hit areas was New Orleans East. Shortly after the supercell passed through, severe damage to homes and businesses was reported by local media. Emergency managers reported at least 60 homes and businesses were damaged in New Orleans East, and at least 20 people were hurt. Following a preliminary survey, the National Weather Service said the tornado was at least EF2 in strength. New Orleans East is home to at least 65,000 residents, down from 95,000 prior to Hurricane Katrina, which devastated the area in 2005. New Orleans East is a neighborhood in the city's Ninth Ward. In some areas, homes that were rebuilt after Katrina were damaged or destroyed by Tuesday's tornado. Yoshekia Brown was one such example; her home was destroyed by the monster hurricane, and on Tuesday, three-fourths of her New Orleans East home collapsed, according to the Associated Press. "I lived in between two blighted properties. One of those would have been gone before my house," she told the AP. "It's just gone. Like the movie Twister." The tornado also left damage to NASA's Michoud Assembly Facility and the USDA's National Finance Center's Primary Business Center. The buildings are located adjacent to one another in Michoud. "At this time, only minor injuries have been reported and NASA employees and other tenants are being accounted for," NASA said in a statement Tuesday afternoon. "There is still a threat of severe weather in the area and emergency officials are continuing to monitor the situation to ensure the safety of onsite personnel. The onsite Michoud emergency response team is also conducting damage assessments of buildings and facilities." Late Tuesday morning, a tornado was reported south of Killian, a town of about 1,200 northwest of Lake Pontchartrain. The tornado possibly crossed Interstate 55 between Akers and Ponchatoula. That storm moved east, prompting a tornado emergency to be declared by the NWS for parts of St. Tammany and Tangipahoa parishes. Emergency management reported a tornado from the storm in Madisonville, about 35 miles east of Killian, where additional damage was confirmed. In Livingston Parish, at least 10 homes were damaged and two minor injuries were reported, deputy emergency management preparedness director Brandi Janes told the AP. "Two of them are completely gone ... all the way to the ground," she told the AP. Hail as big as ping-pong balls was observed near Kenner, Louisiana. More than 10,000 homes and businesses lost power in southeastern Louisiana because of the storms, according to the Times-Picayune. A few severe storms also developed early Tuesday morning, producing quarter-size hail near Little Rock, Arkansas, while a wind gust to 62 mph was clocked in Henning, Tennessee. As severe storms marched east, a waterspout reportedly came ashore in Destin, Florida, Tuesday afternoon. According to the Pensacola News Journal, the reported tornado damaged the roof of McGuire's Irish Pub and hit an EMS vehicle, injuring one person.